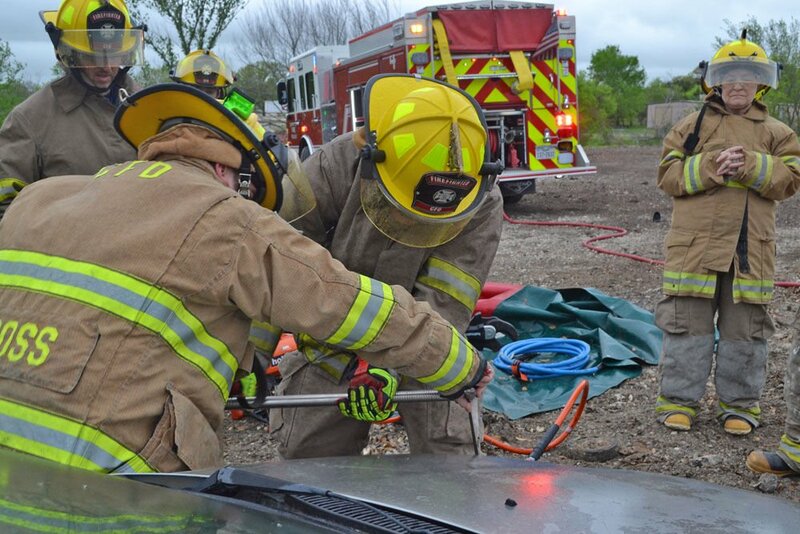 Courtesy photo Week six of the Corsicana Fire Department's Citizens' Fire Academy covered how to extract a victim from a crashed vehicle. 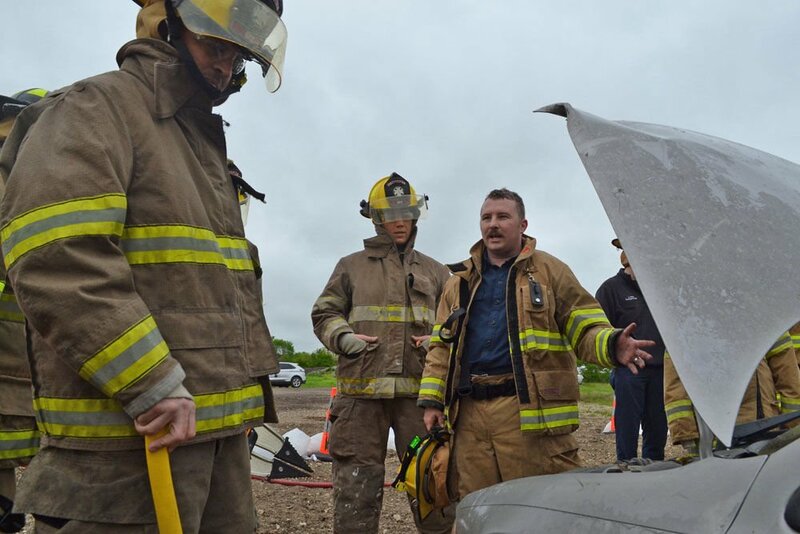 Editor's note: Corsicana resident Jonathan Wilson is enrolled in the Corsicana Fire Department's eight-week Citizens' Fire Academy designed to expose all of the services the fire department provides through demonstrations and participation. Week six of Citizens' Fire Academy blew me away. I confess I have been waiting for this one. I was going to get to cut up a car! Instead of a Thursday evening at the main fire station, this class was Saturday morning in an empty piece of property just off Business 45. We were here to watch, learn and operate the powerful tools the fire department utilizes to get people out of vehicles that had been involved in an accident. To ensure our safety we all dressed in full bunker gear and boots, with the addition of safety glasses. Again, this protected us, and I have to say that the gear did make me feel safer, but it also allowed us to understand the restrictions of the uniform, and the increased complexity of tasks while fully suited up. I was warm in the bunker gear and mentioned to one of the firefighters that it must better in the winter; at least the gear provides warmth. He commented that there is really no good season to be fully suited up. In the winter you are warm, but when you work, you sweat. If you take the gear off you get cold quickly, and if you leave it on you could overheat. In the summer, the gear holds in the heat as you work. It is like going outside on an August afternoon, wearing your heavy winter coat and boots to mow the lawn for 45 minutes. The good news is, you can take it off during scene clean up. When I learn these things, I start to question my fantasy of being a firefighter, realizing that even though I imagine this calling as being difficult, the reality is so much more extreme. The class was split into two groups; with each assigned its own car. First we were taught to open the hood of the car and cut the battery cables. This is done to prevent possible airbag deployment from occurring while the firefighters work on the vehicle. We used the Halligan tool to create an opening and then used a hydraulic spreader to open the hood. The car we were working on did not have a battery but we cut the battery cables anyway. A hydraulic spreader is an amazing tool; less than 30 pounds but packing a scary amount of force which can be used to bend the car in order to save the victim. After cutting the battery cables we stabilized the car. Stabilizing the car involved puncturing the tires with a Halligan tool and then placing blocks on either side of the car, wedging them into place. I am not going to lie here, after using the Halligan tool… I really want one. I have absolutely no reason to own one and my wife said "absolutely not" but that has not stopped me from pricing them on the internet. Next, we covered the victim, played by Buster, the fire departments training dummy, with a blanket to protect him from the glass as we broke the windows. We got to use a punch to break the glass. Another aside, the firefighters recommended that everyone keep one of these tools in their vehicles in the event that a vehicle ends up in deep water. This tool can be used to cut through seat belt restraints, and punch out glass to allow to swim clear of your car. Despite Chief Paul Henley’s reminder about always opening the door in the simplest manner (i.e. using the door handle if possible) we used a Halligan tool to make an opening large enough to insert the hydraulic spreader, and force open the door. I would be lying if I did not say that there is a real thrill in the crushing of metal and the pop when the door breaks open. The next step was to remove the door to gain full access to Buster, er…the victim. We learned how to use the hydraulic cutters to sever the wires and hinges that hold the door to the car. The hydraulic cutter is a tool that looks like giant curved blade scissors or a birds beak. But don’t be fooled; they have the power to snap metal with the ease of a hot knife through butter. Again, the power of these tools was amazing, and the fact that anyone let me play with them was amazing beyond my wildest dreams. After the door was removed, we were shown how the dashboard could be moved off of a victim. While many methods were discussed, the one demonstrated was the process of cutting a notch in the body of the car near where the drivers left foot would normally be. After the hydraulic cutter was used to cut a notch in the frame of the car near where the drivers left foot normally sits, the hydraulic spreader was inserted into the notch and opened. As the hydraulic spreader opened the dashboard, the steering wheel slowly rose. It was easy to imagine how those extra 14 inches could make all the difference when rescuing a person stuck under the dashboard in an accident. After we removed the dashboard, we were taught how to remove the roof. The firefighters pointed out while this is not often necessary it is always an important option. We used the hydraulic cutters to carefully cut each roof post. One important thing we learned was to remove the plastic coverings on the doorposts. The firefighters explained that in modern cars with many airbags it is important to look before you use the hydraulic cutters so you do not cut into one of the canisters that inflates the airbags, hurting yourself or others. I never imagined this would be a necessary part of firefighter training but is so important for the safely of the firefighters and all involved. Much like the Tim Allen character, I really enjoyed using these amazing power tools. But as much fun as I had with the tools I have to say the best part of Citizens Fire Academy has been the access to the firefighters, EMTs, Paramedics and officers. The gentlemen of the fire department (I say gentlemen because there are no women at the moment but I know Chief Henley would love to change that) have been very generous in cooking for us (amazing ribs), teaching us, answering our questions, telling us stories from “the streets,” spending time before and after classes setting up and cleaning up and most of all, never laughing at us, no matter how difficult we make things.